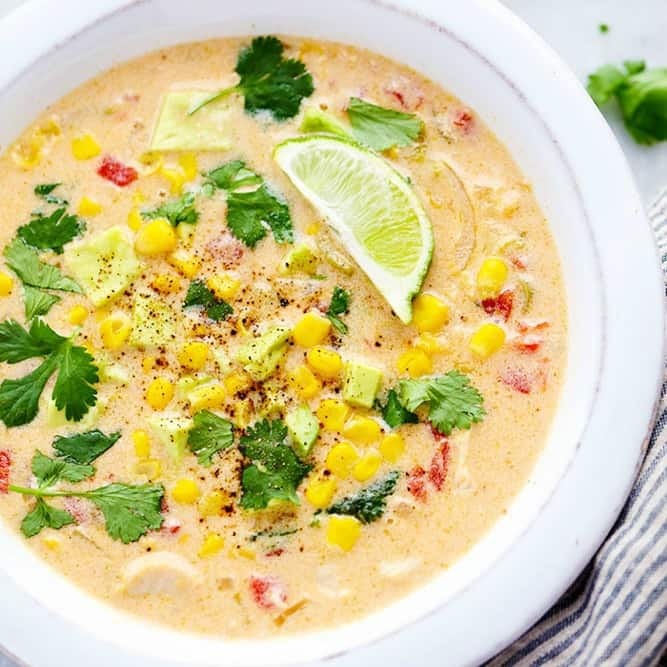 Mexican Chicken Corn Chowder is creamy, cheesy and so easy to make! It has just enough of a kick to it and the flavor is incredible. 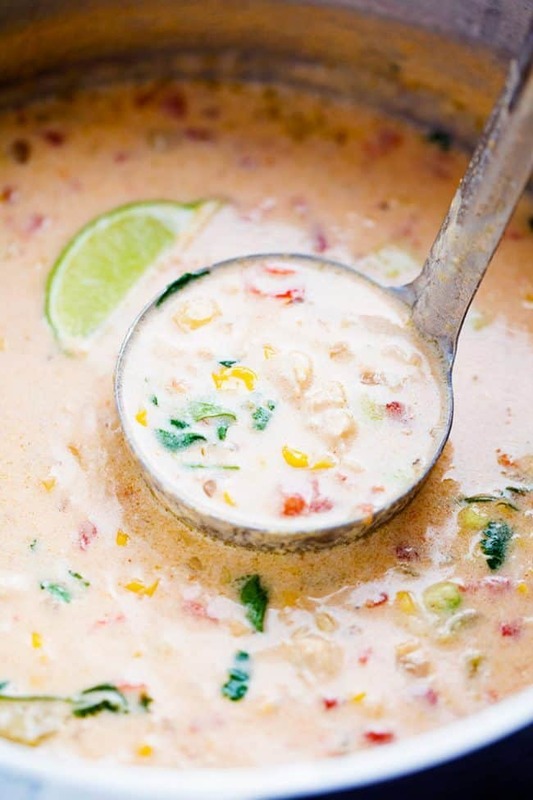 This will be one of the best chowders that you will eat! I sometimes get inspired for recipes in the most random places. Being a homeowner you spend a lot of time at The Home Depot. I got talking with an associate and they asked me what I did for work. I explained to them that I had a food blog. He then told me that he had a recipe that I HAVE to try. 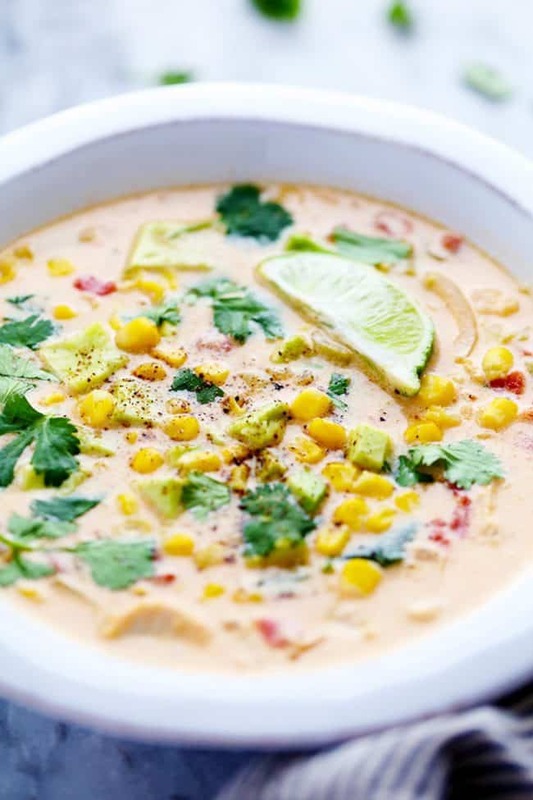 He said that this Mexican Corn Chowder is the best soup that he has ever had. So the next time I was in he had the recipe for me. He was so excited for me to make it. One of the best parts about this recipe is that it is incredibly easy to make!! I already loved the recipe. 😉 You literally just dump in a few cans and add some cheese and half and half and let it simmer. I also used rotisserie chicken which made this recipe even easier to make. It came together within 5 minutes. As soon as I took my first bite I was blown away! It was fantastic! My favorite part was being able to top it with my favorite toppings. You can also crumble some cotija on top and add some cilantro, diced avocado, or whatever your heart desires. 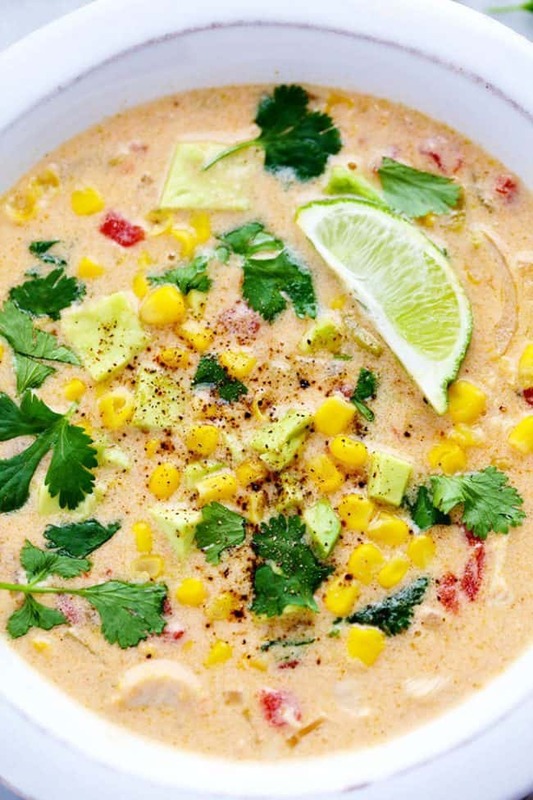 Our entire family loved this soup and I know that you will too. It is the perfect soup for a chilly day and you will make it again and again! In a large pot or dutch oven add the butter and melt over medium high heat. Add onion, jalapeño, and garlic. Cook for 1-2 minutes until tender. Add the cumin. Add the broth and bring to a boil. 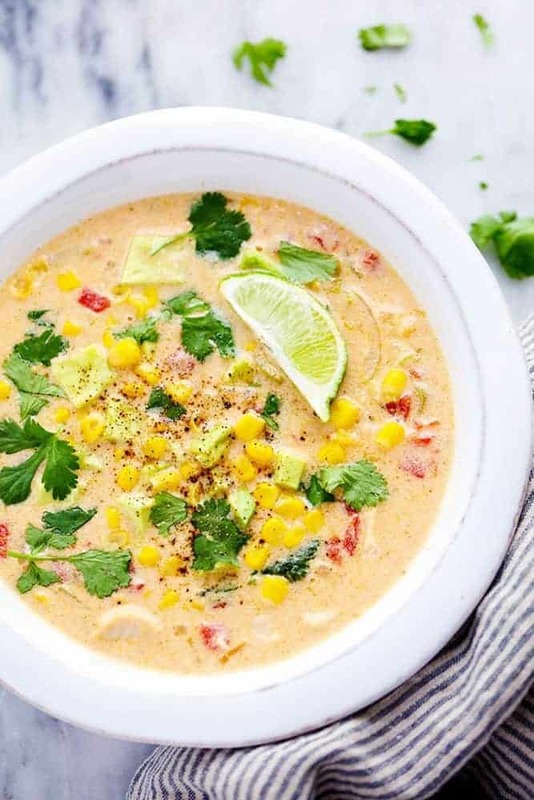 Reduce the heat to low and add in the cream, shredded cheese, cream- style corm, green chilis, diced tomatoes, and chicken. Cook until the cheese has melted and all ingredients are heated through. Season with salt, pepper, tabasco sauce, and top with favorite toppings. Great idea for the “spoons season” ! Great photos too. Thank you ! You grabbed me with the magic words “Mexican” and “corn.” But there’s no cream-style corn in France! Or fresh. Just plain canned. I will have to improvise. Fresh cream? My daughter LOVES corn but she is lactose intolerant. What could I use in place of the half and half? You could add unsweetened coconut milk. Sometimes I’ll purée cooked potatoes or cauliflower and add it to my soups to give a creamy mouthfeel without the cream. I made this yesterday to serve today during the Vikings game. It was fabulous! Being from the very deep south quality veges year round is a must so I keep rolls of creamed corn in the freezer. Creamed corn in yellow and white that tastes field fresh!! If I remember I thaw it over night in the fridge, if not I remove the wrapper and put it in whatever it’s going in. (I monitor it closely to prevent scorching and/orburning). This is OUTSTANDING!!! I have made several times…first time followed exactly (delicious) 3rd time, substituted 1lb shrimp with 1lb jalapeño sausage sliced! (instead of chicken) and used fat free half and half (AMAZING) ABSOLUTELY DELICIOUS recipe!!! 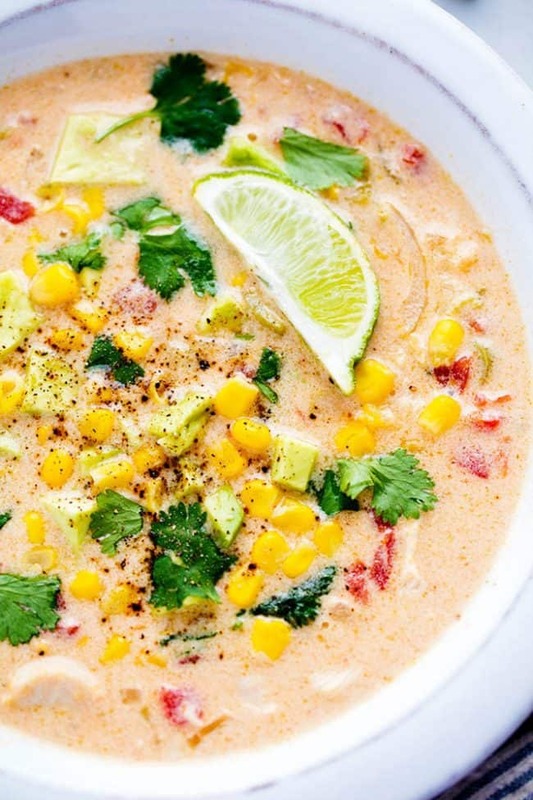 One of our favorite soups! This soup is AMAZING!!!! I followed the recipe – I just added a can of whole kernel corn in addition to the cream corn. I couldn’t stop eating – my husband raved about it as well! Thank you so much for sharing!!!! This recipe was delicious! However, I used my whole can of green chilies (which was slightly larger than the 4 oz can in the recipe) and it was spicy enough that I didn’t need to extra kick of the tabasco. I also used 2% milk as I didn’t have cream and it was great! This recipe was fantastic. It just moved to the top of the list as our favorite!